City cops were walking the beat Wednesday, chasing deals instead of bad guys. They were serving as personal assistants for underprivileged children as the annual CopShop took place at Billings Bridge and Carlingwood shopping centres. “I’m buying clothes like, pants, stuff like that, shoes,” said Hasanain Obaid, 9. Armed with separate $100 gift cards for the mall and Target, he strategically whizzed through Billings, scooping up belts, toys, and a soap dispenser for the bathroom. “I’ve got a kid that’s well organized. It looks like he practiced yesterday, and he knows what he wants, and there’s no wasting time,” said Const. Marc Soucy. Libert Banderembako, also in Grade 4, had fun trying on shoes at Payless with two traffic cops. Const. T.J. Jellinek helped him get fitted, while Const. Jon Hall held his bags. Banderembako picked up two pairs, along with a Leapster game system to share with his siblings. “I have three,” he said. Children in need are selected for the program each year. Some were shy or intimidated around uniformed officers. ﻿”We always break the ice there with a few jokes, and a fist bump here and there,” said Hall. Beforehand, they were treated to lunch and a visit from Santa. CopShop began eight years ago in Halifax. This month, more than 300 children across Canada are benefitting. 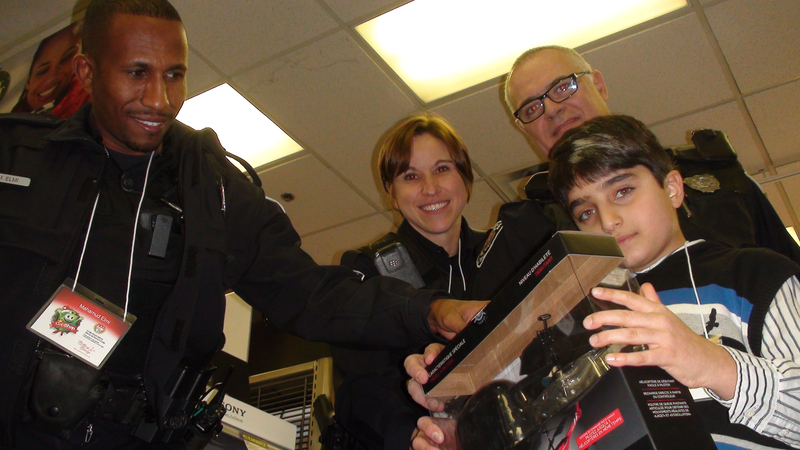 “It’s something that they’re going to remember for the rest of their life,” said Const. Mahamud Elmi.